Just print your own section title page and slip into Table of Contents sleeve. Table of Contents sleeve is color-coded to index tabs for fast referencing. An easy way to make a professional-looking index. 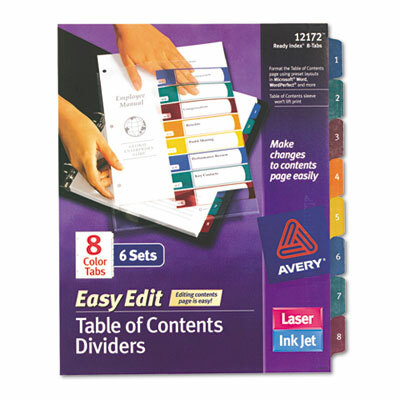 Just print your own section title page and slip into Table of Contents sleeve. Table of Contents sleeve is color-coded to index tabs for fast referencing. An easy way to make a professional-looking index. Three-hole punched for use in standard ring binders.